LouLou is a British designed, award-winning label that has produced a successful range of vintage-inspired designs for over 25 years. LouLou showcases a passion for innovative design, using ideas from iconic screen movie stars, the Impressionists & theatrical design. Focusing on creativity & imagination in their designs, this range of bridal wear is perfect understated glamour. The focus remains on creating vintage style wedding dresses, which is a huge trend worn by thousands of brides across the country. With understated glamour, a LouLou bride will look chic & convey romance as she glides down the aisle. The relatively new Louise Bentley is an exquisite collection of British designed Wedding Dresses coming from the same people behind the well-established & successful Loulou label. 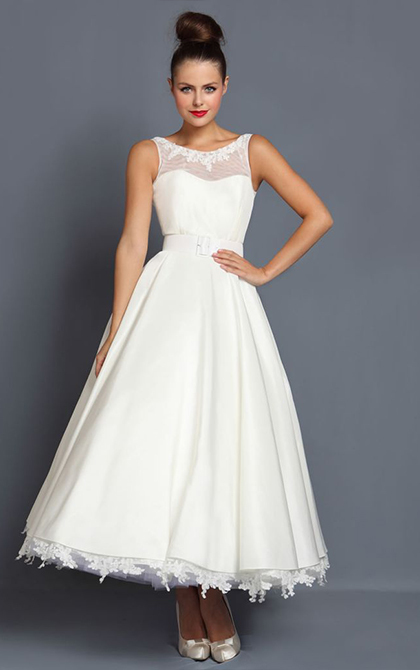 Playful tea length dresses & classic A line skirts are flattering for all figures, meaning that a Louise Bentley wedding dress is a must to try on for any bride. To make an appointment give our lovely team a call on 01384 01384 291600 or use the Book Now button!